Sangrai, the traditional dance of the Mog tribe of Tripura would be performed in the ceremonious Republic Day parade in Delhi. Around 150 tribal students have been selected from 25 schools of three districts of Tripura for the occasion. 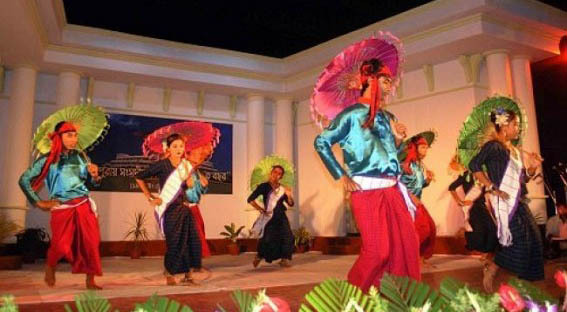 Cultural Affairs Minister Bhanu Lal Saha today said the Tripura students will perform ‘Sangrai’ dance of Mog community. Besides, student performers from 25 schools of three districts and 25 trainers are accompanying them. He said the students were selected this year from the entire eastern region to perform in the parade. Eastern Zonal Cultural Centre extended their help to send Tripura dance troupe to Delhi. Sangrai, the traditional dance of the Mog community is performed on the occasion of Sangrai festival during the month of Chaitra (in April) of the Bengali calendar year. The dance form originated in Tripura, India. The Mog are the Arakanese descendents who live in Tripura since the Arakan kingdom’s control over the state in the 16th century. Arakanese descendants living in present-day Bangladesh are known as Magh or Marma people. The Mog Buddhists have close affinity with Burmese Buddhism in all socio-cultural and religious aspects.